A Tree Grows in Brooklyn – Eat Me. Drink Me. A berry is never as nice as when it’s picked directly from the bush, and even nicer when its unexpected. Mulberries, say my neighbors, are what’s growing on the trees. 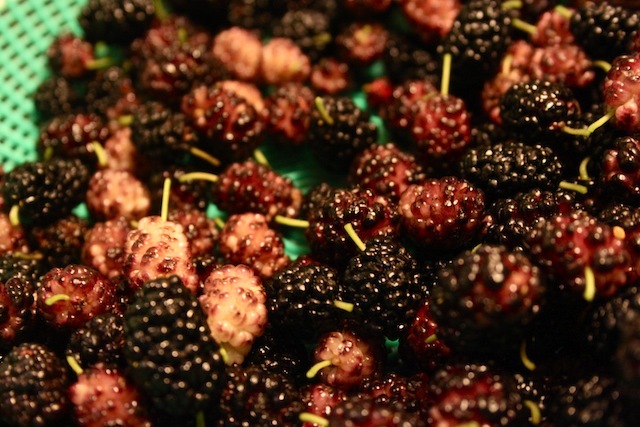 I had always imagined mulberries to be sour, prickly things. I don’t know why – I’ve never even eaten anything mulberry flavored nor even seen a mulberry live. And now I have more mulberries that I know what to do with, so every morning I step outside and shovel a new, ripe batch into my mouth. As I lay reading in my hammock today, I stared up at the sky through the mulberry leaves and spied a bunch of grapes intertwined in the bush. And in the corner of the fence, a crabapple tree. What bounty in Brooklyn! Inspired, I jumped up from my hammock, brushed away a nap just about to settle, and walked to the plexi-glass wrapped liquor store down the street. 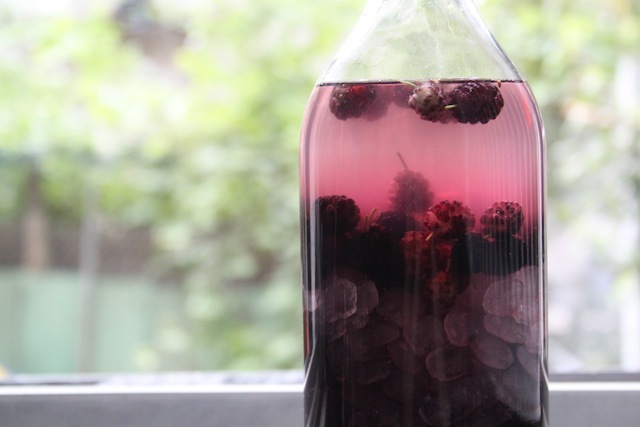 Last summer, my grandfather and I had bottled raspberry and blackberry liqueur with fruit from his garden. We spent our mornings picking fruit and measuring cubes of sugar and rum and our evenings sampling finished bottles from our experiments the summer before. He reminisced about his childhood and we talked about our family and how it has grown. He is taciturn, my grandfather, and for us to sit for hours in the kitchen washing berries, was simply an excuse to be together. He sent me home with a few bottles of raspberry liqueur, a box of German kandis sugar and a book of recipes. 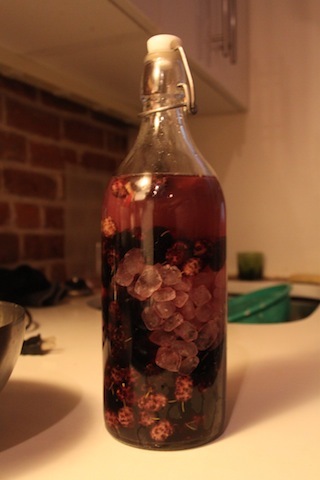 I bottled my first liqueur today. I didn’t use a recipe, just asked my hands to remember how many raspberries I’d funneled into each jar, how much sugar, vanilla, and rum. 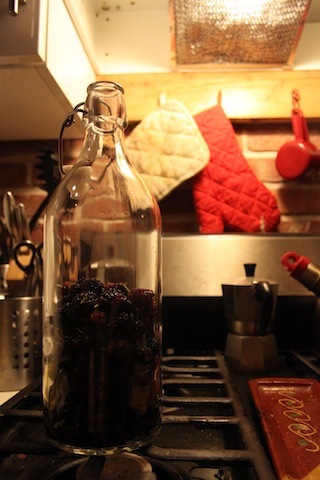 And with every mulberry I dropped into the glass, I thought about how proud my grandfather would be that I was bringing Germany to Brooklyn. And how much he’ll like chatting over a glass the next time I see him. First of all, don’t eat unknown berries. The appendix can get irritated by seeds that get stuck in it… Mulberry appendicitis?